Sometimes you just want to kick back and relax by the pool with a good book, watch a late night movie before bed or nurse your hangover by watching a dvd in bed. At Pedro’s Hotel not only do we provide cheap rooms and priceless adventure, we offer a wide range of amenities: bike rental, pool, kayak and snorkel rental, wifi, AC, Cable TV with 80 plus channels, dvd, on site sports bar /pizzeria, breakfast bar, and fun friendly staff. 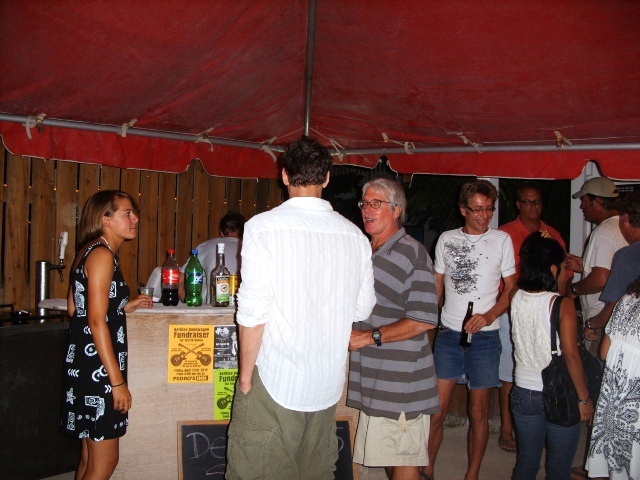 We regularly do Special food nights at Pedro’s Pizza. Tonight it was Pasta and Paella night which was a big hit. People came hungry and ended the night fully satisfied. Cheers to Martin and Walter for doing a great job in the kitchen. Last night we had a big fundraiser party hosted by ambergrisvacations.com / San Pedro events Calendar and All Cayed up. The band was great – there was a huge turn out – everyone had a fab time and and lots of money was raised to help get the talented young Bass Player Derrick off to Berklee Summer music camp. Go to tacogirl.com to see more pictures. Pedro’s is a perfect place to hold your fundraiser or party – we have a pool – barbecue – large outdoor area – outside bar option. For more information how you can have a fundraiser at Pedro’s Pizza please call – 226 -3825.